American Episode 112: "Here Comes The Squirtle Squad"
As our heroes' journey continues, they find themselves falling for a pitfall trap. The creators of the prank are a group of Zenigame who run off once they hear the sirens of Junsa's police bike. At the police box, Junsa explains that the group is known as the Zenigame-Gundan ("the Zenigame Corps") and has been terrorizing the people nearby with their practical jokes. Meanwhile, the Rocket-Dan are enjoying a boxed lunch when they are approached by the aforementioned Zenigame Corps and are ordered to hand over the food. The trio refuses, so the Zenigame kidnap tie them up and eat their food anyway. 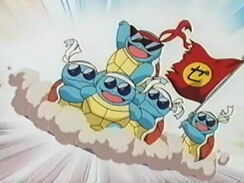 Nyasu is able to convince the turtle pokemon that he's on their side and proceeds to enlist their help in capturing "three bad trainers with a Pikachu." The water-type pokemon succeed, but Satoshi's Pikachu gets hurt in the process. After a while, the Zenigame let Satoshi run into town to buy some medicine, but when he gets back, Nyasu and the Rocket-Dan are gone. Eventually, they reappear in their hot air balloon and start throwing bombs around. At one point, Satoshi saves the leader of the Zenigame Corps, so they all work together to defeat the Rocket trio as a show of thanks. The Rocket-Dan are sent blasting off again, but the bombs they threw left behind a blazing inferno in the forest! Luckily, the Zenigame work together to put out the fire, saving the day. Junsa awards the pokemon for their bravery and makes them honorary firefighters for the town. Now that the gang's reign of terror is over, Satoshi and his friends go to continue on their journey but are stopped by the gang's leader. The Zenigame wants to go along with Satoshi on his journey and the young trainer accepts, adding a powerful new ally to his growing team of friends. So this is the last episode in that unofficial mini-arc where Satoshi catches the three starter pokemon. And really...I found this one to be the weakest. Especially when it comes to the motivation for the pokemon to come along for the next 200+ episodes. Fushigidane went with Satoshi because...it protected the village with it? I dunno. Hitokage went with Satoshi because he saved its life. Makes sense, kind of. But Zenigame? "You helped save my gang, so I'm going to leave them for no reason and join you." It just seems like the anime writers finished this story about a gang of pokemon who reform their ways and then suddenly realized that they had forgotten to give one of the pokemon to Satoshi. So, they just kind of had the pokemon volunteer to join at the last minute. Captures aside, this episode is one of those episodes that just would not be made in this day and age. Not with all the death threats, Japanese references, and guns, anyway. It's actually really sad to see how much more kid friendly (for lack of a better term) the show has become ever since it became an international hit, and there are times when I wish the show could go back to a time when the anime producers just made a show without worrying how other countries in the world will react. The dubbed version has a pretty awful script this time around. You'll see a lot of dialogue edit sections below, but there are still a few more that I didn't bother mentioning because they're so minor. This episode also gives us the first onigiri-Western food change as well as a scene involving guns that somehow managed to come through unedited (at least visually, anyway). Other than that, we get the standard paint edits. 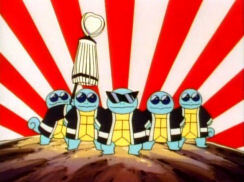 Ash: "With my very own Squirtle, Gary will never beat me! Go, Pikachu!" Satoshi doesn't mention Shigeru in the Japanese version at all; he just says that he'll try to catch one of the Zenigame. 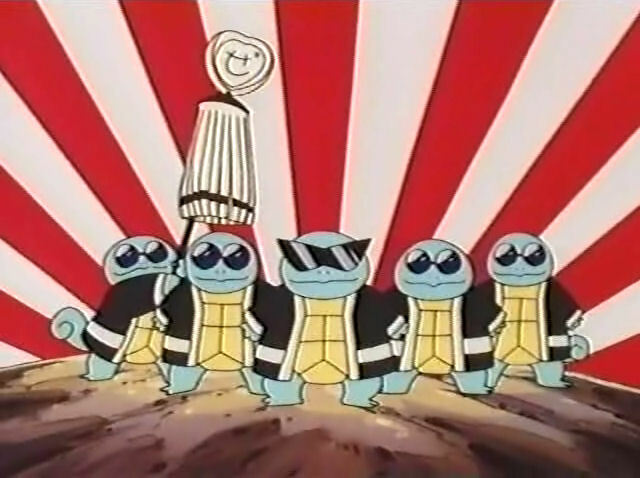 Jenny: "That Pokémon gang calls itself the Squirtle Squad." 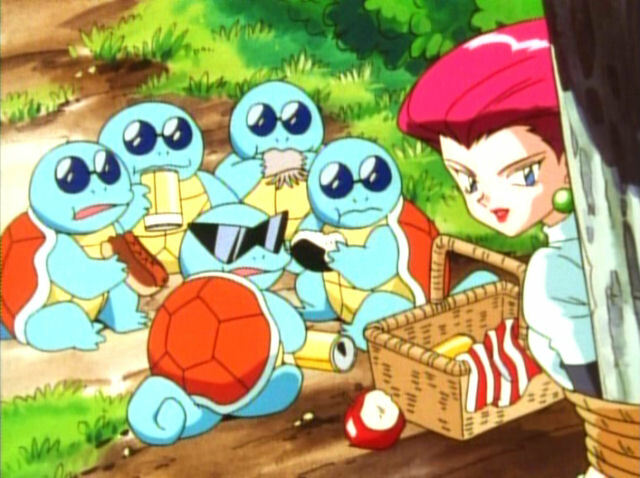 Misty: "I've never heard of a Pokémon gang." Jenny: "They're all Squirtles who were deserted by their Pokémon trainers." First of all...no, the gang of Squirtle don't call themselves "the Squirtle Squad." Since...y'know...they can't talk. Originally, Junsa simply said that's the name they're known as, and it's implied that this name was given to them by the people in the area who are suffering from their pranks. Secondly, Satoshi's final line in the section I quoted is different as well. After Junsa tells everyone that the Zenigame have been abandoned, Satoshi says "not again," most likely referring to the Hitokage he just rescued an episode earlier. I have no idea why any of these changes would have been made. When Junsa’s telling Satoshi-tachi about the Zenigame-Gundan, the flag that one Zenigame is holding up has the katakana symbol ze (as in “Zenigame”) on it. 4Kids erased this. In the very next shot, the bank on the upper right-hand corner of the screen has the yen symbol (¥) erased. I don't think I have to say that Team Rocket's mention of pizza, Chinese food, and tacos weren't present in the Japanese version. Jessie: "Oh no! They're eating all the jelly donuts and éclairs!" James: "I want a donut!" Those things the Zenigame (and later, Nyasu) are eating aren't donuts; they're onigiri. They're a common snack in Japan and are pretty much a staple of any Japanese boxed lunch, but most people in the U.S. don't know the word. "Rice balls" are a common translation of the food item name but, again, most people in the U.S. wouldn't really associate "rice ball" with "snack item." The reason I say this edit is historic is because it's the first of many, many instances where the characters will call onigiri by a more Western food name. The dub is never really consistent with what they call the food item - at least half a dozen names have sprung up over the years - but they almost never call it by what it actually is. While I can sorta-kinda see where 4Kids is coming from in changing the name of the food item, I also don't think it's really all that necessary since the food items aren't the focal point of the scene in question. They're just there in the background, and stating outright that they're rice balls or donuts or whatever isn't really necessary for kids to understand what's happening on-screen. But I will say this; calling rice balls donuts is a lot better than what 4Kids would eventually end up doing. Oh, and as far as the éclairs go? I think that's meant to be the hotdog-looking thing that the one Zenigame is eating in this shot. 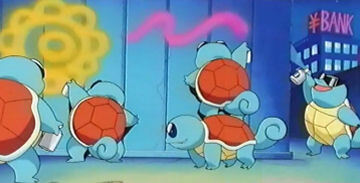 When Ash is pleading to the Squirtle Squad to let him go into town to buy a Super Potion, he tells them that Pikachu will be in "big trouble" if he doesn't get it some help. Originally, he tells the Zenigame-Gundan that Pikachu will die. Seems kind of like a wussy edit to make after the last episode, huh? Meowth: "The Squirtle says that if you're not back here by noon tomorrow the red-headed girl gets her hair dyed purple." Misty: "Purple!? Why you mangy little flea trap...when I get out of this I'm gonna wrap your tail around your -"
Ash: "Misty! Don't worry! I'll be back, OK?" Originally, the Zenigame threaten to execute Kasumi (the word they use is 死刑 shikei), not the more kid-friendly threat used in the dub. Kasumi responds by saying that if those are the conditions, she should be the one to go into town instead. Also, Misty's dub line reminds me...we don't have any flea pokemon, do we? At the end of the episode, when the Zenigame-Gundan are wearing their coats, the ze on the back is erased. In the very next shot, the ze on the matoi being held up is also erased. This last paint edit here is one of those "missing the forest for the tree" edits. Because even though they erased the Japanese writing in an effort to make the scene more "Western-friendly," 4Kids ignored the fact that the other 99% of the shot just screams Japan. You've got the Japanese military flag in the background. You've got the Zenigame-Gundan dressed up as machi-bikeshi, a group of firefighters who protected Edo (modern-day Tokyo) during the 18th century. And then you've got the one Zenigame in the back who's holding up a matoi, a standard that's used to alert other people that there's a fire nearby. This edit was most likely a case of 4Kids trying to be consistent by erasing all the Japanese text, but in a situation like this, it just doesn't make any sense at all.